Day of Unity in Montclair – My Voice. My Vision. Thank you to everyone who supported the first event of Voice and Vision. Whether you joined us in spirit, shared our event online, talked about it with friends, or talked about domestic violence with someone you love, your support makes this work possible. Monday, October 6, 2014 at 7:30 p.m.
Join us for a candlelight vigil recognizing the National Day of Unity for Domestic Violence Awareness Month. Victims, survivors, and their loved ones come together for a Day of Unity, bringing domestic violence out from behind closed doors. As we share our stories through song, testimony, poetry, dance and art we give voice to victims still in chains, honor the loss, and create a vision for a future where women and children are safe at home. To share a testimonial, song, poem, art, or to dedicate a candle in memoriam to a lost victim or honoring survivor please register here or contact Laurice at survivor@voiceandvisionnj.org. The vigil will be held on the lawn at the Unitarian Universalist Congregation at Montclair, 67 Church Street. The grounds are a registered Peace Site. 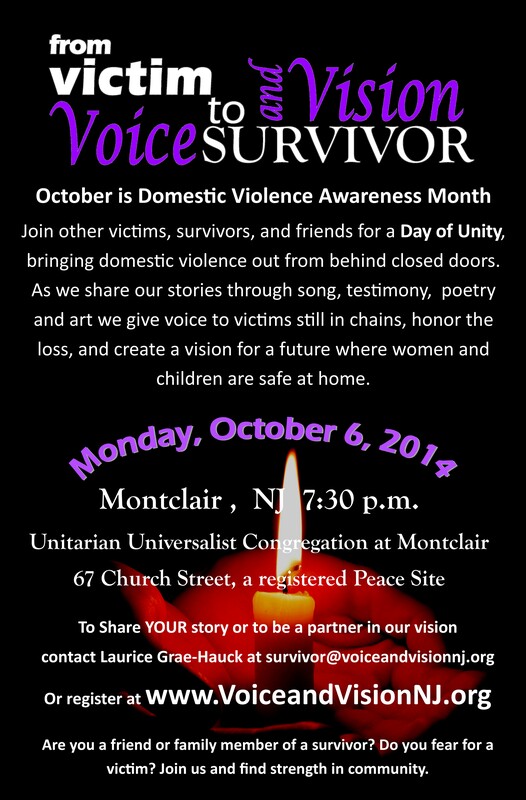 Stay posted on Facebook and on Twitter @VoiceAndVisionNJ or #DayOfUnityMontclair. If you or someone you love is in need of immediate assistance call the National Domestic Violence Hotline at 1−800−799−7233.